The students of the UISS were sent home on Tuesday morning, after smoke was observed coming from a concrete manhole on the school grounds, close to the schoolâs auditorium. When the manhole was opened, a conduit, which had been cut open, leaving electrical wires exposed, was observed. âIt seems as though water started dripping into the box, and the wires started burning,â a source told SEARCHLIGHT. 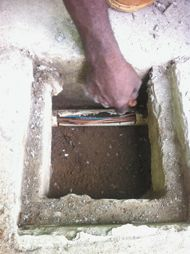 According to the source, an electrician from the Buildings, Roads and General Services Authority (BRAGSA), who inspected the manhole and its contents on Wednesday, told members of the schoolâs staff that had two of the wires touched, there may have been an explosion strong enough to blow the cover of the manhole off. The source said the schoolâs teachers took a decision on Wednesday that they would not return to school until the entire compound had been thoroughly checked and determined to be safe. Last year, SEARCHLIGHT reported that parents of students attending the UISS had kept their children away from school on October 8, 2012 to protest problems identified with the electricity and plumbing at the institution. The problems at the school first surfaced following the electrocution of a dog in November 2011. Then, in September 2012, a student âalmost lost his life after a quantity of electricity went through his body,â a letter dated September 27, 2012, from the Parent Teacher Association (PTA) to the Chief Education Officer Lou-anne Gilchrist, said. The letter stated that there were faulty outlets and instances where equipment malfunctioned. Last October, a team of electricians and plumbers from BRAGSA visited the school and was said to have conducted rectification work. Following this, Permanent Secretary in the Ministry of Transport and Works Hudson Nedd gave the assurance that the electrical issues that were considered to be problematic at the Union Island Secondary School (UISS) had been corrected. Nedd, in an interview with SEARCHLIGHT, said the electrical problems experienced by users of the building were mainly caused by degeneration of the electrical work, because of the salty air. The letter to Gilchrist in September 2012 requested an inspection of the schoolâs electrical system by a certified inspector and that a report be submitted to the PTA; and that all electrical hazards in and around the school compound be corrected. According to our source, however, no report from the electrical inspectorate was ever submitted to the PTA. âYes, BRAGSA did work, but the electrical inspector never came back to inspect anything. After BRAGSA finished, they never did a thorough inspection of the compound. That was never, ever done,â the source said. An email sent on Wednesday to Permanent Secretary in the Ministry of Education Nicole Bonadie-Baker, which was copied to Chief Education Officer Lou-Anne Gilchrist, enquiring about the situation, was unanswered up to press time. However, our source said Gilchrist, through the principal of the UISS, informed the teachers that they would be informed when it is safe to return to school. The UISS, which was constructed at a cost of $13 million, was officially opened on August 21, 2010, about one year after students began taking classes there.